If you’re looking to find the best riding lawn mower then you’ve come to the right place. These powerful machines can take the work out of mowing a large lawn and are incredibly easy to operate. They’re great for large properties and for users who don’t want the hassle of pushing a heavy gas mower across their grass. See push mowers here! But deciding which option is right for you can be confusing. Riding lawn mowers are the perfect alternative to standard walk-behind mowers (much like reel mowers), allowing you to drive the machine around your yard, much like you would an automobile. As an alternative, you may wish to look at our top 10 list of Electric Lawn Mowers (read review here). Since you’re not required to push these models, they’re the perfect option for anyone looking to save time and energy when mowing their large garden. A good sturdy wheelbarrow will also save you time! But since a riding mower comes with a wide-variety of features, specs, and designs, it can be tough finding the right model for your needs. Shopping in the winter months? You might be looking for a snow blower instead. View the Best Riding Lawn Mower on the Market, Below. 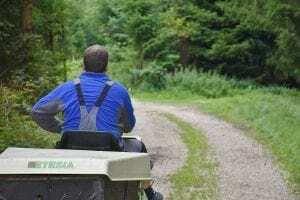 What is the Best Riding Mower for Hills? What are the Best Lawn Tractor Brands? What is the Best Rated Riding Lawn Mower Engine? How to Start a Riding Lawn Mower? What to Look for When Buying a Riding Lawn Mower? And that’s not to mention the large number of reputable brands out there. Put all of that together and purchasing one of the yard tools can be just as difficult as buying a new car. But luckily, we’ve done the legwork for you. We’ve reviewed the top mowers on the market and looked at their design, performance, features, specs, and reviews. What we’ve come up with is our list of the top 10 riding lawn mowers of 2019. So if you’re ready to hop on a riding mower so that you can finally make cutting your grass a breeze, just keep reading. We’re confident that after reading through our list, you’ll be able to find the model that’s perfect for you. Looking for the overall Best Lawn Mower? Husqvarna is known for building high-quality lawn mowers and the Z246 is no exception. This innovative model is part of their z200 zero turn series and earns the top spot in our list of the top riding mowers of 2019. Designed to deliver high performance and power in a sleek, cutting-edge design, the Z246 takes the work out of mowing your lawn. Its 46” 13 gauge steel cutting deck is rugged and can make quick work of any yard. And its 23 HP Briggs & Stratton V-Twin 724cc Endurance Engine with premium air filtration, chrome plated valves, finished bearing surfaces, and an oversized cooling fan, was designed for power and durability. A maintenance-free zero-turn transmission means you don’t have to spend valuable time on maintaining this mowing tractor. And, thanks to being designed to draw air from the top and bottom of the deck, it offers improved grass lift for exceptional cut quality. For ease-of-use, the Z246 was designed with an ergonomic control panel that puts everything at the operator’s fingertips. Add in some impressive features like a bumper with integrated headlights, automatic parking brake system, and 3 anti-scalp rollers to protect your lawn, and you have one of the most impressive mowers in its class. See more information on Husqvarna Z246. The Husqvarna Z246 Z-Turn Mower is one of the most impressive mowers in its class. Sturdy and reliable, this workhorse delivers exceptional results but is incredibly easy to operate. A powerful 23 HP motor and smooth EZT transmission makes driving this model a breeze and with its solid construction, it’s one of the smartest buys on the market today. Husqvarna makes it onto our list of the top riding lawn mowers again with the GTH52XLS Yard Tractor. This is a powerful, user-friendly workhorse that allows you to tackle large landscapes as simply as if you were driving a car. With tons of features and a sturdy build, it’s one of the most impressive options available. Backed by a 24 HP Briggs & Stratton engine, a pedal-operated EHD hydrostatic drive FAST automatic transmission, and an auto-choke feature, this machine is maintenance-free, powerful, and starts with a turn of the key. For durability, its 52” cutting deck features twin sheets of 11 gauge steel, a heavy-duty chassis, and cast iron axles. Rear differential increases your traction when mowing wet grass or navigating inclines and 4 anti-scalp wheels protect your turf from damage. With an ergonomic design, an adjustable high back seat, arm rests, and a comfort-grip steering wheel, it’s incredibly comfortable to operate. And with an easy electric cutting blade engagement switch and a fender-mounted deck lever all within reach, you have all the controls you need right at your fingertips. See more information on Husqvarna 960450057. At $3349, the 815 lb Husqvarna GTH52XLS is certainly a premium purchase but it also delivers some of the most impressive results in its class. Powerful, precise, and easy-to-use, this machine is capable of tackling even the largest yards in no time. And with its solid construction, headlights, impressive features, and user-friendly design, it’s one of the top buys out there for anyone looking for a powerful riding mower that will withstand years of heavy use. For homeowners with medium or large yards, the Troy-Bilt 382cc 30” Neighborhood Riding Lawn Mower is one of the most impressive options featured in our list. This versatile mowing tractor combines the benefits of a standard rider with the compact size of a wide-cut walk-behind gas model. With a powerful 382cc, 6-speed transmission, auto-choke OHV engine, it is capable of a top forward speed up to 4.25 MPH. And you can select the perfect cutting height for your grass thanks to its 5-position cutting height setting. For comfortable use, Troy-Bilt designed this 382cc with an adjustable seat that raises to mid-back and a large 13” soft grip steering wheel. For durability, this compact model was built with a 14-gauge cutting deck for improved durability and an 18” turning radius that allows you to maneuver just as easily as you could with a walk-behind lawn mower. See more information on Troy-Bilt 382cc. The Troy-Bilt 382cc is perfect for anyone looking for an affordable riding mower that is capable of taking the effort out of mowing medium-sized yards. It lacks the wide cutting deck that other more expensive mowers offer but it’s great for anyone looking for a machine that can be stored in a shed or garage without taking up a lot of space. Delivering great performance and easy operation while being as compact as a walk-behind model, it’s one of the most impressive buys in its class. Looking for a powerful, aggressive riding mower that can easily mow your yard with clean, perfect results? Then the Cub Cadet XT1 Enduro Series V-Twin Riding Mower is one of most impressive models that you can buy today. It earned its spot in our list thanks to its impressive performance, rugged design, power, and versatility. With a 24 HP Kohler V-Twin OHV engine and hydrostatic transmission, the XT1 is powerful, smooth, and goes at the push of the pedal. Push-button cruise control allows you to choose the desired speed and lets this machine’s 50” triple blade deck do all the hard work. A 12-position cutting height feature allows you to achieve the perfect cut. And with smooth, reliable steering and a 16” turning radius, this riding mower can tackle sharp turns and navigate obstacles with ease. The XT1 is both durable and comfortable. A soft, rubberized steering wheel and high-back seat reduces user fatigue. And the E-coat corrosion defense system helps to ensure that your mower is resistant to wear and tear. And with optional accessories like a snow thrower, twin bagger, and mulch kit, it’s truly a year-round landscaping tool. See more information on Cub Cadet XT1 V-Twin. Rugged and powerful, the Cub Cadet XT1is one of the top buys available on the market today. It’s easy to operate and offers incredibly smooth, impressive handling and performance. It’s weather-resistant and offers automobile-like control, allowing you to mow large yards in record time. And with a ton of optional accessories available from Cub Cadet, it’s incredibly versatile and can be used all year round. If you’re looking for one of the most affordable riding mowers on the market, then the Poulan Pro 15.5 HP Rider is one of the top options out there. This powerful machine earns the 5th spot in our list and delivers reliable performance, durability, and some features that you’d only expect to find in many of the more expensive models out there. With a 15.5 HP Briggs & Stratton single cylinder OHV engine and a large 42” reinforced cutting deck, this Poulan mower can tackle large properties easily. And its automatic hydrostatic transmission allows you to adjust speeds with a simple move of the fender-mounted lever. And the oscillating front axle with a 6” turning radius allows you to navigate rough terrain and make tight turns for less trimming work. A 6-position cutting height feature allows you to adjust the tractor’s cutting deck to match the desired length of your grass. And with the purchase of optional mulch and bagging attachments, you get an incredibly versatile grass-cutting machine for a little over $1,000. See more information on Poulan Pro 960420192. At just over $1,200, the Poulan Pro 15.5 HP is one of the most affordable buys available on the market today. It’s capable of tackling difficult terrain easily and provides the power and smooth, reliable performance that you’d expect from some of its pricier competitors. If you’re looking for a simple but efficient mower that is easy to use but capable of easing the burden of mowing your grass, it’s one of the smartest buys that you can make. Cub Cadet makes our list of the top models on the market today again with their XT1 Enduro Series Kohler Hydrostatic Gas Front-Engine Riding Mower. This power-packed dynamo isn’t only incredibly affordable, it also delivers impressive performance and a smooth hydrostatic transmission that eliminates the need to shift gears. With an impressive 18 HP Kohler OHV engine and 42” cutting deck, this is one of the most impressive mowers in its class and cuts grass easily with clean, precise results. Its rear wheel drive offers great traction and handling and a 16” turning radius is great for getting into those hard-to-reach corners. Raising or lowering the cutting deck is easy thanks to a fender-mounted lever and push-button cruise control allows you to focus on steering instead of having to worry about maintaining the perfect speed. This model from Cub Cadet is incredibly comfortable to operate with adjustable seating, soft-grip steering wheel, and even a cup holder. And its built-in headlights ensure you’ll be getting optimum mowing conditions anytime of the day or night. See more information on Cub Cadet Xt1 Enduro Series. If you’re looking to mow lawns with slightly uneven terrain, this 18 HP rear wheel drive model is one of the greatest models out there for you. It delivers exceptional performance and an impressively smooth ride. And at just over $1,800 it’s one of the most affordable buys on the market today. Poulan makes our list of the top mowers on the market with the Poulan Pro P46ZX. This powerhouse yard tractor was designed to deliver impressive performance and durability while being incredibly easy to handle. The P46ZX is powered by an impressive 22 HP Briggs and Stratton V-Twin Pro engine and dual hydro-gear EZT drive system for a smooth and easy ride, even on uneven yards. A 46” stamped steel reinforced deck is durable while allowing you to mow large lawns in less passes. And its 6-position cutting height adjustment allows you to quickly set the perfect cutting height for your lawn. Plus, as part of the Poulan PRO Zero Turn Radius series of mowers, the P46ZX offers a zero-turn radius. This means that you can turn your riding mower on a dime, navigate around obstacles with ease, and finish mowing the grass quicker than with other riding models on the market. And with foam-padded handle grips and a comfortable, extra-high seat back, it delivers an incredibly comfortable mowing experience. The Poulan Pro P46ZX offers some of the best comfort, durability, and performance of any riding model we’ve featured in our list. With a 42” two-bladed steel deck and 22 HP Briggs and Stratton engine, it’s powerful and delivers clean, precise cuts. The zero-turn radius is incredibly impressive and reduces operational time, saving your riding mower from unnecessary wear and tear. At only $2,449, it’s one of the best values on the market. The Husqvarna LGT2654 Garden Tractor makes our list of the best riding mowers available in 2019 thanks to its sturdy build, impressive power and performance, and amazing versatility. Husqvarna has been manufacturing terrific riding mowers for years and this model is no exception to the rule. With a powerful 26 HP Kohler V-Twin engine and automatic hydrostatic transmission, the LGT2654 is powerful and offers a smooth forward and reverse speed without the need to shift gears. A reinforced 54” cutting deck provides added strength while being able to mow down a large yard in less time than smaller riding models on the market. And its cruise control feature allows you to stop worrying about maintaining the perfect speed and focus on steering this workhorse across your yard. A fender-mounted cutting height adjustment and electric blade engagement keeps the controls at your fingertips while its built-in headlights allow you to mow your grass in any lighting condition. And with a variety of accessories available from Husqvarna, you can use this powerful riding model for practically anything. See more information on Husqvarna LGT2654 Hydro Light. This is one of Husqvarna’s most impressive riding models to date. With 26 HP, it’s a true workhorse and its hydrostatic automatic transmission delivers an incredibly smooth ride. With a 54” cutting deck, it can tackle any lawn in less time than many competitors on the market. And it was built with enough durability to withstand years of heavy use. Poulan has been earning a few spots in our list of the top riding models and gets another mention with the Poulan Pro PB20VA46. Since 1944, this company’s line of mowers has provided power, performance, and reliability, and this model is one of the best riding models in its class today. With a 20 HP V-Twin Briggs and Stratton engine with ready start and a pedal-controlled fast auto drive transmission, this model is both powerful and incredibly smooth to maneuver across the grass. A 46” reinforced cutting deck allows you to make wide passes on your lawn for a faster operating time and a 16” turning radius means that it can easily maneuver around tight turns and obstacles. Its 20” rear and 15” front tires are great for handling any terrain and with its built-in headlights, you can trim your grass early in the morning or late at night. And its 13” mid-back seat and comfort-grip steering wheel ensure that your ride will be easy and comfortable. See more information on Poulan Pro 960420170. If you’re looking for a powerful, reliable riding mower that can tackle a large lawn leaving professional results, then the Poulan Pro PB20VA46 is one of the best purchases that you can make. It’s ruggedly built and delivers impressive power and smooth cutting performance. A wide cutting deck, high-performance engine, automatic transmission, and a boatload of user-friendly features makes it one of the best options for anyone looking to make mowing the lawn as easy as possible. Husqvarna gets another mention in our list of the best buys on the market in 2019 with the Husqvarna YTA24V48 . This model is a true workhorse that lives up to the brand’s solid reputation for high-quality, high-performance garden tools. Versatile, powerful, and capable of incredibly impressive results, it’s one of the best grass cutting tools in its class. With a 24 HP Briggs & Stratton Intek 2 cylinder engine and FAST automatic transmission, the YTA24V48 offers premium performance and quality results. The pedal-controlled transmission features a choke less start and requires less power to drive, translating to more cutting power. Air induction boosts the airflow within its 48” reinforced 13 gauge steel cutting deck, allowing for a consistent cut every time. A fender-mounted cutting height adjustment deck lever and electric blade engagement system means that everything is at your fingertips. And with its adjustable seat and ergonomic steering wheel, Husqvarna makes mowing the grass with this model as simple as if you were driving a car. Add in the compatibility with the brand’s numerous accessories like towing, snow removal, and mulching kits, and the YTA24V48 is an incredibly versatile landscaping powerhouse. See more information on Husqvarna YTA24V48. If you’re looking for one of the best mowers in its class, this model from Husqvarna is a terrific option. This 670 lb riding mower is powerful and built to withstand years of heavy use, making it a great investment. It delivers the impressive performance and high-quality results that you’d expect from a premium model. It leaves your lawn looking crisp and neat while being as easy to operate as an automobile. And with your ability to use this machine with an assortment of yard accessories, it’s capable of year-round use. A sloping or hilly landscape might add tons of character to your property but it’s certainly not easy to mow. In fact, a lawn with hills can be up to 20 times tougher to maintain that a flat yard especially if you’re trying to use a walk-behind model to mow uphill or downhill. Luckily, this is why these mowers are so convenient. While these powerful models make mowing the grass easy, it’s best to make sure that you purchase one that is perfect for uneven terrain. This will ensure that your rider is both efficient and not prone to slipping or tipping over. One of the best options for tackling hills on the market is the Husqvarna GTH52XLS Yard Tractor. This brand is a leader in tractors, riders, and other outdoor equipment and this model is capable of tackling any demanding lawn easily. The GTH52XLS features a powerful 24 HP Briggs & Stratton engine and a pedal-operated hydrostatic transmission which allows you to drive this mower without shifting gears. A heavy-duty chassis and cast iron axles provide the support that you need to navigate the slopes of your grassland while its 52” cutting deck makes quick work of even the largest piece of property. And thanks to this model’s rear differential, it offers increased traction when you’re driving on inclines or wet grass. Stable, reliable, and powerful, this impressive mower by Husqvarna offers fantastic performance and is one of the best options if you’re looking for a riding mower that can handle the hilly terrain. Since a reliable, high-quality lawn tractor can cost up to $3,000, it’s important to make sure that the model that you’re planning to invest in is up to the job. One smart way to ensure this is to stick to one of the best brands making riding mowers today. By purchasing a mower designed by one of these reputable brands, you can expect dependability, high performance, power, and quality results. Some of the best brands out there today are Poulan, Cub Cadet, and Husqvarna. All three of these leading manufacturers have built a solid reputation for themselves thanks to their knack for offering high-quality, powerful outdoor power tools. All three brands offer well-designed, sleek mowers that are built from sturdy materials and are capable of delivering years of quality performance. Under the hood, all of these manufacturers offer impressive specs with powerful engines and smooth, automatic transmissions. Husqvarna and Poulan design their models with industry-leading Briggs & Stratton engines while Cub Cadet’s models tend to rely on the ample power supplied by dependable Kohler engines. This power allows you to easily tackle any yard in no time, delivering impressively precise results. And with versatility and ease-of-use in mind, you can’t go wrong buying a mower from one of these brands. Most offer the ability to use a variety of accessories that will allow your machine to do much more than simply mowing the lawn. And since these brands have designed their mowers with all of the controls within easy reach of the operator’s fingertips, you simply drive the mower across your turf like a car, letting the machine do all of the hard work. A quality riding lawn mower engine needs to hit a few checkboxes. The engine has to have the power you need to achieve the perfect cut, even on large lawns. It needs to be reliable, offering consistently quick starts with no hassle. And it needs to be made from durable components that will allow it to last for years. Briggs & Stratton engines hit all of these requirements and are some of the best engines for mowers on the market today. These engines were designed to deliver high-quality performance with a minimum of hassle. And with a range of options available, such as single-cylinder and v-twin engines, these powerhouses can give basic riders, zero-turn mowers, and full-scale tractors with large cutting decks, the optimum power they need to get the job done right every time. The reliability and performance offered by B&S is why many of the top brands out there, such as Poulan and Husqvarna, rely on their engines to serve as a backbone for their lawn-cutting workhorses. Starting a ride on tractor is actually incredibly easy. Thanks to electronic systems, powerful engines, and smooth automatic transmissions, most of the models on the market today can be started in a matter of seconds. To start your mower, you simply need to adjust the cutting height of your cutting deck to your desired setting. Most models now included fender-mounter levers that allow you to adjust this setting easily. Then simply climb into the seat of your rider and, depending on the model you own, either press the start button or turn the on/off switch. Thanks to their automatic transmission, these mowers don’t require you to shift gears or operate a clutch when changing speeds or switching from forward to reverse. Instead, you’ll normally just have to use a foot pedal to increase and decrease your speed. And thanks to several models now offering cruise control, manufacturers have even made that task easier than ever before. Riders are one of the best ways to tackle large yards easily, delivering professional results while requiring just a fraction of the effort that comparable walk-behind mowers would demand. But before you go out and purchase one, there are several factors that need to be considered. By looking at each of these items, you’ll be able to find the right option for your lawn and what type of riding lawn mower you want to purchase. Engine horsepower, or HP, is the measurement used to describe the engine’s power output. This power output is what’s available to be shared between the various components of these mowers such as the drive transmission and the cutting blades. 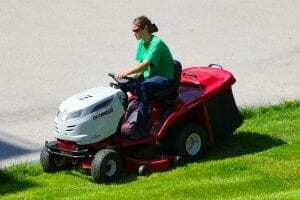 The more HP the engine provides, the more power that can be distributed between tasks such as moving the vehicle across the lawn or up hills, while also providing the cutting power needed to make quick work of heavy grass conditions. Due to the power needed to perform both of these tasks simultaneously, mowers with a power output around 20 HP or greater is usually perfect for demanding or large properties. The cutting width of ride on mowers measures how wide a swath of grass the tool can cut in one pass. Smaller, more compact mowers can have a cut width as low as 30” while larger mowers can have cutting deck widths of up to 50” or more. What needs to be considered is the size of your yard. If you have a smaller property or one with hard-to-reach spots and obstacles like trees that you’ll need to maneuver around, then a smaller cutting width is great. But if you have a large property with a relatively open layout, a larger model will allow you to tackle the job easily and in less time. The fuel capacity of riding mowers describes how much gas each can hold in the tank. This generally correlates with the size of the model. The main thing to be concerned with here is that you don’t want to purchase a model that doesn’t have the fuel capacity required to adequately tackle your turf. The last thing you want is to have to stop in the middle of mowing to refuel. 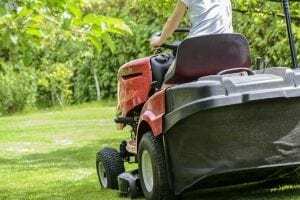 Because of this, while mowers with a small fuel capacity are perfectly fine for medium-sized yards, mowers with a large fuel tank are better suited for large properties. The transmission of a mower is what transfers power from the engine to the wheels, allowing the machine to drive forward or in reverse. The three options available are manual, automatic, and hydrostatic transmissions. Manual transmissions have a range of set speeds that you can select. Older models might require you to shift between speeds by using a clutch or even stopping. This isn’t practical. So if you are choosing a manual model, make sure that it allows you to easily shift without using a clutch while your grass tractor is moving. Similar to the transmission in a car, an automatic transmission allows you to control the speed of your tool with a gas pedal. This is great if you want easier control over your ride or need to frequently slow down to drive around obstacles. A hydrostatic transmission is similar to an automatic one. The difference is that these systems use fluid instead of belts to transfer power from mowers engines to their wheels. This fluid-based system delivers the smoothest ride on the market and normally requires the least amount of maintenance. Our list of the top models covered several incredibly impressive mowers but our recommendation for top pick on the market today is the Husqvarna Z246 23 HP 46” Zero Turn Mower. This lawn-cutting dynamo boasts a powerful 23 HP Briggs & Stratton V-Twin engine and a smooth, low-maintenance transmission for terrific performance. Thanks to its sturdy 46” cutting deck, it can make wide swathes, reducing the time needed to cut large yards. And with zero-turn technology, this model can navigate any tight turn, making it a great option to tackle yards with trees or other obstacles. The Z246 was designed to last but is also incredibly easy and comfortable to operate. You can easily reach everything on the ergonomic control panel right from your seat, allowing a once tedious task like mowing turf to be remarkably easy and enjoyable. The Z246 delivers great power, smooth performance, and impressive results. It’s one of the most user-friendly models out there. And at only $2,799, it’s one of the best buys available on the market today. If you’re looking for a premium option, one of the best mowers available on the market today is the Husqvarna GTH52XLS Yard Tractor. This is one of the most reliable and powerful models on the market and is perfect for any homeowner who wants to make mowing their large turf as simple and quick as possible. A powerful Briggs & Stratton 24 HP engine drives this workhorse and, thanks to its pedal-operated hydrostatic transmission, it runs smooth and is virtually maintenance-free. Plus, the 52” twin blade, 11 gauge steel cutting deck can make impressively wide swathes for a faster work time. Designed to be durable, this model features cast iron axles and a heavy-duty chassis. And if you intend to mow on sloping terrain or wet grass, the rear differential has got you covered, preventing you from slipping and providing better traction than its competitors. You may also be interested in a powerful leaf blower to keep control of debris. If you’re on a budget and are looking for the best deal on the market, the best value today is the Troy-Bilt 382cc Premium Neighborhood. This model is capable of tackling a medium-sized garden easily. And, since it’s also incredibly compact, it’s easy to store and can even navigate tight spaces and narrow areas. With a 6-speed transmission and a 382cc auto-choke OHV engine, this model can reach a top forward speed of 4.25 MPH and, for easy start-up, doesn’t require you to meddle with a choke. Click here for the Lawn Mower emissions study. A 30” 14-gauge cutting deck is perfect for making quick work out of your turf while allowing you to maneuver around obstacles like trees or walkways. And a 5-position cutting height lever allows you to choose the perfect cutting height for your type of grass. With a high adjustable seat and ergonomic steering wheel, this rider is incredibly comfortable to operate. And thanks to its simple design, this is one of the most user-friendly models on the market. Compact, powerful, and durably-built, this model costs only $1,249 (click here for mowing costs study) and is one of the best buys on the market today. We hope you enjoyed our article on "The 10 Best Riding Lawn Mowers for the Money in 2019", if so, please share and rate it. This Troy-Bilt 382cc 30-Inch lawn mower is well built for the price it’s cuts really good.